Hi my name is Robert and I am an addict. I started using Percodan in my early 20s to help me sleep when the cocaine ran out. Well it wasn’t long that I was using both drugs daily, after about eight years I kicked the coke, which I thought was my drug of choice. WRONG. I secretly replaced one with another and not even thinking I thought I was clean. WRONG. That’s the addict in all of us that use. I used any and all opiates I could get my greedy hands on. I used for 18 years daily never running out. Of coarse when I ran low I would freak out and try to limit just how many I would take for the next few day’s until I found more. And I always found more. Some days I would take 50 to 80 pills, some days less. Every morning 5 to 10 pills, noon the same 4:00pm the same and so on, everyday. I was a functioning addict that had to use just to maintain. I worked 12 to 14 hour’s 6 day’s a week and rarely missed a day. On Jan. 12th 2003 I quit cold turkey. I was sick, sick, sick, heavy-duty withdrawal. But I was determined. I worked everyday and I wasn’t very productive but I was there. It took me over 2 months till I started feeling better. Then I keep telling myself I was different I can use again and not get hooked, well how foolish although I lasted almost 2 years. Then came the first couple pills within two weeks I was off and running, but this time I added Methadone to the mix. I found out just two or three Methadone’s would carry me all day and night. 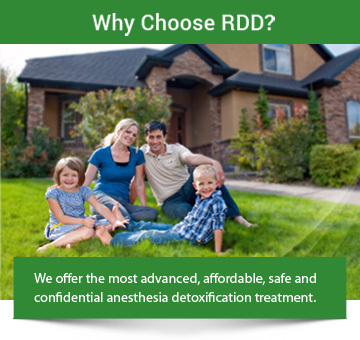 One night I was checking out the Internet and I came across Rapid Drug Detox Center. Well this wasn’t what I was looking for but I book marked it anyway. Over the next few months I would go to this and read, I would read it over and over again. I was hitting bottom and I wanted off, I tried several times to quit but I couldn’t, I knew what I was in for and couldn’t do it. So I called them and the lady that answered the phone was Jeanne, she asked a few questions and said gave me a date and said this will be your day. Wow was I ever scared, 2200 miles from home, total strangers looking at me, analyzing me, but there was a comfort zone, they understood me, the opiate addict. It really does work. The hard part comes when you get home and start your life all over. It’s tough, lots of feelings that were masked in your old addicted life. It pulls at you, your dark side then your clean side. Please find God First, the desire to stay clean, N. A. meetings, work the program, and have the implant, the opiate blocker, this works well. Rapid Drug Detox Center got me clean and the staff are all the greatest. To Jeanne one more time thank you, you saved my life and got me clean. If anybody wants to know more call the staff and I would love to help.